Ndamukong Ngwa Suh (/ᵻnˈdɑːməkᵻn ˈsuː/ in-DOM-ə-kin SOO, born January 6, 1987) is an American football defensive tackle for the Miami Dolphins of the National Football League (NFL). He was drafted by the Detroit Lions second overall in the 2010 NFL Draft. He played college football at Nebraska, where he earned All-American honors. As a college senior, Suh became one of the most decorated players in college football history. He won numerous awards including the Associated Press College Football Player of the Year Award, Bronko Nagurski Trophy, Chuck Bednarik Award, Lombardi Award and Outland Trophy, and was recognized as a unanimous All-American. Suh has been criticized for his aggressive style of play and has been fined eight times through 2014 for a total of $255,375 by the NFL, with seven for player-safety violations, and suspended once (for two games), resulting in the loss of an additional $165,294 in pay. Despite issues with sportsmanship, Suh is widely recognized as the best defensive tackle in the NFL and among the very best defensive players in the league. In 2015, Suh was named the 24th best player in the NFL, while being the sixth highest ranked defensive player. He's won numerous awards and accolades, having been named the Defensive Rookie of the Year, whilst being selected to four Pro Bowls in his first five seasons, and having been named an All Pro every year he's been in the NFL, four times to the All Pro First team, including his rookie year, and once to the All Pro Second team. In 2015, Suh became the highest paid defensive player in NFL history, having signed a six-year contract with the Miami Dolphins, worth in excess of $114 million, with nearly $60 million fully guaranteed. Suh was born in Portland, Oregon. He attended Grant High School in Portland, where he was a three-sport star in football, basketball, and track. He played as a two-way lineman for the Grant Generals. Suh earned first-team All-PIL honors on both offense and defense as a junior and was an honorable-mention All-state pick. In his senior year, he collected 65 tackles, including 10 sacks and recovered four fumbles, which earned him Parade magazine high school All-America honors, the 2004 Portland Interscholastic League Defensive Player of the Year, and a Class 4A first-team all-state selection. He also played in the 2005 U.S. Army All-American Bowl. In basketball, he earned honorable-mention All-League honors as a junior and senior. "2005 Nebraska Football Commitment List". Rivals.com. Retrieved 2013-02-12. "2005 Nebraska Football Commits". Scout.com. Retrieved 2013-02-12. "Scout.com Team Recruiting Rankings". Scout.com. Retrieved 2013-02-12. "2005 Team Ranking". Rivals.com. Retrieved 2013-02-12. As a junior in 2008, Suh recorded a team-high 76 tackles, 7.5 sacks, 19 tackles for loss, 2 interceptions (both returned for touchdowns) and a touchdown reception while playing fullback. He became the first Nebraska defensive lineman to lead the team in tackles since 1973. 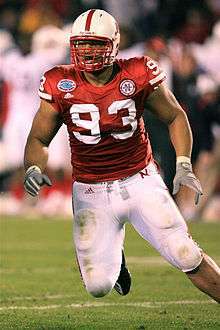 Suh earned First-team All-Big 12 honors in 2008, the first Nebraska interior defensive lineman to earn those honors since Steve Warren in 1999. He was also an honorable mention All-American. On December 7, 2009, Suh was named a finalist for the Heisman Trophy. Later that evening, Suh was named the 2009 Bronko Nagurski Trophy winner as the top defensive player in the nation. CBS Sportsline also named Suh their Defensive Player of the Year. The Touchdown Club of Columbus named Suh the winner of the Bill Willis Trophy on December 9, 2009. That same evening Suh won the Lombardi Award for the top collegiate lineman or linebacker. On December 11, at the ESPN College Football Awards show, Suh was selected as the winner of the Chuck Bednarik Award as the nation's best defensive player and took home the Outland Trophy for the best interior lineman. Suh finished fourth in the Heisman race, accumulating 815 points, which is the highest total by a fourth-place finisher for the Heisman in its history. He was also one of four unanimous selections to the AP First-team All-America in 2009. Suh was named the 2009 AP Player of Year, becoming the first defensive player to receive the award in its history. For off-the-field marketing activities, Suh signed with The Agency Sports Management & Marketing, where Russ Spielman served as lead agent. At the NFL Combine, Suh bench pressed 225 lb 32 times and had a 35½ inch vertical leap, the highest for a defensive tackle since Al Lucas (36 in) in 2000. Before the NFL draft, Suh signed with Maximum Sports Management and agent Roosevelt Barnes. This caused moderate concern for many teams who were hoping to draft him, as this was the same agent who represented Michael Crabtree. Crabtree was the longest 2009 NFL Draft 1st round contract hold out, waiting over six weeks into the NFL season before signing with the San Francisco 49ers. Crabtree had even threatened to re-enter the 2010 NFL Draft. Nevertheless, Suh was selected second overall in the 2010 NFL Draft by the Detroit Lions, becoming the first defensive lineman selected by the team in the first round since Luther Elliss in 1995. Suh was the highest selected Cornhusker defender since Neil Smith in 1988. Suh racked up 53 tackles and 8.5 sacks. In Week 17, against the Green Bay Packers, Suh stepped on quarterback Aaron Rodgers' calf. Suh received a one-game suspension, seemingly barring him from the Wild Card playoff game the following week against the Dallas Cowboys; but on appeal, arbitrator Ted Cottrell reversed the suspension, opting instead for another fine worth $70,000. Suh played in the Wild Card match-up against the Cowboys and sacked Tony Romo twice. During a game against the Washington Redskins on September 13, 2015, as Redskins' running back Alfred Morris was still lying on the ground following a tackle, Suh appeared to knock Morris's helmet off with his leg. The next day, the NFL announced that they would not discipline him, as "Suh's action was not deemed a kick". Nonetheless, Suh started all 16 games in 2015, finishing the season with 61 tackles, six sacks, and five passes defended. Suh’s mother, Bernadette (née Lennon) Suh, an elementary school teacher, was born in Spanish Town, Jamaica, and is a graduate of Southern Oregon University. His father, Michael Suh, is from Cameroon and played semi-pro soccer in Germany while working as a machinist. They met and married in Portland, Oregon, in 1982, after Michael Suh was admitted to a Portland trade school. Although his father is only 5 ft 8 in (1.73 m), Suh's great-grandfather, also named Ndamukong Suh, stood 7 ft 3 in (2.21 m). In the Ngemba language of Cameroon, Ndamukong means "House of Spears". Suh has four sisters; he is the second oldest of the children. His older sister and manager, Odette Lennon Ngum Suh, played soccer collegiately at Mississippi State University and is currently a midfielder on the Cameroon women's national football team. His cousin, Kameron Chatman, plays for the Michigan Wolverines men's basketball team. On April 17, 2010, at the annual Husker Spring Game, Suh announced a $2.6 million donation to the University of Nebraska. Two million dollars of his gift will go to Nebraska Athletics for its Strength and Conditioning Program, and remaining $600,000 will create an endowed scholarship for the UNL College of Engineering, from which he graduated in 2009 with a degree in construction management. His gift is the largest single charitable contribution by any former player, and occurred before Suh was taken with the second overall pick in the 2010 NFL Draft. Suh, a former Grant High School football star, donated $250,000 toward the effort to bring a turf field to Grant High School in 2013. ↑ Merrill, Elizabeth (2010-03-24). "There's no stopping the Suh express". ESPN.com. Retrieved 2010-03-25. ↑ "How Detroit Lions' Ndamukong Suh, who has lost $420,669 in career earnings, beat the NFL". ↑ Petchesky, Barry (December 31, 2015). "Why The NFL Considered Ndamukong Suh A First-Time Offender". Deadpin. Retrieved October 30, 2015. ↑ ""10 reasons the Seattle Seahawks should sign Ndamukong Suh". The Oregonian. 2015-02-10. Retrieved 2015-02-12. ↑ Risdon, Jeff (2013-09-20). ""Ndamukong Suh: Why He's Back to Being a Dominant Defensive Tackle"". Bleacher Report. Retrieved 2015-02-12. ↑ "Rivals.com Defensive tackles 2005". Rivals.com. 2005-01-18. ↑ "Huskers harass Cats in first Holiday Bowl shutout". ↑ 2011 NCAA Football Records Book, Award Winners, National Collegiate Athletic Association, Indianapolis, Indiana, p. 12 (2011). Retrieved June 30, 2012. ↑ Griffin, Tom (November 24, 2009). "Okung, Suh named Outland Trophy finalists". ESPN. ↑ "Suh finalist for Lombardi Award". Grand Island Independent. November 10, 2009. ↑ "SN's midseason All-Americans: Defense". Sporting News. October 20, 2009. ↑ "CBSSports.com 2009 Midseason All-America Team". CBS Sports. October 22, 2009. ↑ Buchanan, Olin; Dienhart, Tom; Fox, David; Huguenin, Mike & Megargee, Steve (August 24, 2009). "Preseason defensive tackle power rankings". Rivals.com. ↑ Richardson, Steve (August 11, 2009). "2009 Outland Trophy Watch List Announced". Football Writers Association of America. ↑ "McCoy among five finalists for Heisman". ESPN.com. December 7, 2009. ↑ "Nebraska DT Suh wins Bronko Nagurski". Rocky Mount Telegram. December 8, 2009. Archived from the original on December 13, 2009. Retrieved December 8, 2009. ↑ "TDC Announces 2009 Football Awards". touchdownclubofcolumbus.com. Retrieved 2012-12-25. ↑ "Suh honored as nation's top lineman". ESPN. December 10, 2009. Retrieved January 3, 2010. ↑ "Texas quarterback Colt McCoy repeats as Walter Camp winner". ESPN. 2009-12-10. Retrieved 2010-12-20. ↑ "Suh places fourth at Heisman ceremony". ↑ "AP All-America: Heisman winner Mark Ingram leads six from Alabama Crimson Tide – ESPN". Sports.espn.go.com. 2009-12-15. Retrieved 2012-12-25. ↑ "Suh edges Gerhart for AP honor". ESPN. December 22, 2009. Retrieved December 22, 2009. ↑ Cooney, Frank (May 11, 2009). "Who's next? Looking ahead to the best of the 2010 draft class". USA Today. ↑ Rang, Rob (July 10, 2009). "Top 32 seniors: Top heavy with the heftier prospects". NFLDraftScout.com. ↑ Brooks, Bucky (September 3, 2009). "OSU's Okung top prospect, Texas' McCoy top QB for next year's draft". NFL.com. ↑ Pauline, Tony (October 22, 2009). "2010 NFL Draft: Top 50 prospects". SI.com. ↑ Kiper, Mel, Jr. (January 20, 2010). "DT Ndamukong Suh tops the first 2010 NFL mock draft". ESPN. ↑ The Sports XChange (October 31, 2009). "Ndamukong Suh". NFLDraftScout.com. ↑ The Agency Sports Management & Marketing. Theagencysports.com. Retrieved on 2012-12-25. ↑ Ndamukong Suh 2010 NFL Draft Scout Player Profile. Nfldraftscout.com (2006-09-21). Retrieved on 2012-12-25. ↑ "Ndamukong Suh Combine Profile". NFL.com. March 4, 2010. ↑ Wojnowski, Bob (September 16, 2010). "Lions defensive line must growl now". The Detroit News. ↑ Fentress, Aaron (October 12, 2010). "Ndamukong Suh's interception adds to Detroit Lions' 44–6 rout of St. Louis". The Oregonian. ↑ "New York Jets vs. Detroit Lions – Recap". ESPN.com. November 7, 2010. ↑ "NFL.com Rookie of the Week". Suh earns 2010 Pepsi NFL Rookie of the Year honors. NFL.com. Retrieved May 8, 2011. ↑ Chrissie Wywrot. "Detroitlions.com Blog | Johnson, Suh Named Pro Bowl Starters". Blogs.detroitlions.com. Retrieved 2012-11-22. ↑ Birkett, Dave; Monarrez, Carlos (January 5, 2011). "Lions' Martin Mayhew: Ndamukong Suh will have surgery, miss Pro Bowl". Detroit Free Press. ↑ Twentyman, Tim (January 25, 2011). "Ndamukong Suh named to NFL All-Pro team". The Detroit News. ↑ Jahnke, James (January 13, 2011). "Lions' Ndamukong Suh wins rookie of the year award". Detroit Free Press. ↑ Birkett, Dave (January 18, 2011). "Lions' Ndamukong Suh: Another rookie of the year". Detroit Free Press. ↑ Wywrot, Chrissie (February 3, 2011). "Suh Voted 2010 Pepsi NFL Rookie of the Year". detroitlions.com. ↑ Kowalski, Tom (February 4, 2011). "Detroit Lions' Ndamukong Suh wins AP Defensive Rookie of the Year award". MLive.com. 1 2 Birkett, Dave (December 29, 2014). "Lions star Ndamukong Suh: A history in discipline". Detroit Free Press. Retrieved October 30, 2015. ↑ Kevin Seifert (November 24, 2011). "Case closed on Ndamukong Suh". ESPN. Retrieved 2011-11-24. ↑ Kevin Seifert (November 24, 2011). "Verbatim: Ndamukong Suh". ESPN. Retrieved 2011-11-26. ↑ Ndamukong Suh apologizes for stomp. ESPN, 2011-11-26. 1 2 Pereira, Mike (2011-11-24). "Suh likely to be suspended for incident". Fox Sports. Retrieved 2011-11-26. ↑ Jay Glazer (November 29, 2011). "Lions' Suh appealing 2-game suspension". Fox Sports. Retrieved 2011-11-29. ↑ "Source: Ndamukong Suh appeals ban". ESPN. November 29, 2011. Retrieved 2011-11-29. ↑ Ndamukong Suh's appeal denied. ESPN, 2011-12-02. 1 2 McIntyre, Brian (November 28, 2012). "NFL fines Ndamukong Suh $30,000 for kick to Matt Schaub's groin". Yahoo Sports. Retrieved December 30, 2012. 1 2 3 "Ndamukong Suh fined $30K in wishy-washy decision by NFL". Sports Illustrated. November 28, 2012. Retrieved December 30, 2012. ↑ "Ndamukong Suh loses appeal of $100,000 fine". NBC. Retrieved 17 October 2013. ↑ Rothstein, Michael (December 30, 2014). "Detroit Lions catch massive break with Ndamukong Suh's appeal win". ESPN. Retrieved October 30, 2015. ↑ Patra, Kevin (March 11, 2015). "Ndamukong Suh, Miami Dolphins strike mega deal". National Football League. Retrieved March 11, 2015. ↑ Walker, James. "Ndamukong Suh signs record deal". ESPN. Retrieved 11 March 2015. ↑ "Ndamukong Suh Stats". ESPN Internet Ventures. Retrieved 9 February 2016. ↑ Suh voted 'dirtiest player' by his peers. Foxsportsdetroit.com (2011-11-08). Retrieved on 2012-12-25. ↑ Van Riper, Tom (October 23, 2012). "The NFL's Most (And Least) Liked Players". Forbes. 1 2 "Suh's roots trace back to Ashland, SOU". MailTribune.com. 2009-12-12. Retrieved 2012-12-25. ↑ Crossman, Matt (March 1, 2010). "The Legend of Ndamukong Suh". Sporting News. ↑ Hairopoulos, Kate (December 4, 2009). "At 6–4, 300 pounds, Nebraska's Ndamukong Suh is a big name in defense". Dallas Morning News. ↑ "Interview with Ndamukong Suh by Mike Nolan, Jr., on February 1st, 2013, in Shanghai, China". SoundCloud file. February 1, 2013. ↑ "Ndamukong Suh Plans on Being Staple of NU Football". The Husker Blog. July 28, 2009. ↑ Marie, Jeanne. "Ndamukong Suh – GQ Profile September 2012: Profiles". GQ. Retrieved 2012-11-22. ↑ Maxwell, Melanie (2015-02-22). "Photo gallery: Rapper Big Sean, Ndamukong Suh among those at Michigan-Ohio State game". MLive.com. Retrieved 2015-02-23. ↑ "Home | Arsenal Player". Player.arsenal.com. 2012-12-17. Retrieved 2012-12-25. ↑ Hibberd, James (May 8, 2012). "Fox's 'The Choice' cast revealed! Joe Jonas, Dean Cain, The Situation, many more -- EXCLUSIVE". Entertainment Weekly. Retrieved April 11, 2013. ↑ "Ndamukong Suh to Donate $2.6 Million to the University of Nebraska". huskers.com. April 18, 2010. ↑ Canty, Collen (February 5, 2010). "Nike Signs Projected Top Pick Ndamukong Suh to Endorsement Deal". NESN. ↑ Dickens, Chris (April 21, 2011). "Subway sign projected NFL pick to endorsement deal". SportsPro Media. 1 2 3 4 Jahnke, James (May 4, 2011). "Video: Ndamukong Suh's new Chrysler commercial". Detroit Free Press. ↑ Yullie, Sean (July 20, 2010). "Video: Ndamukong Suh Hunts Quarterbacks in New Commercial". Pride of Detroit. ↑ Jones, Emmitt. 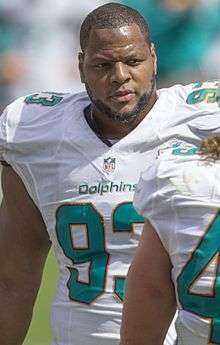 "Ndamukong Suh, the new spokesperson for Omaha Steaks". Sports Business Digest.